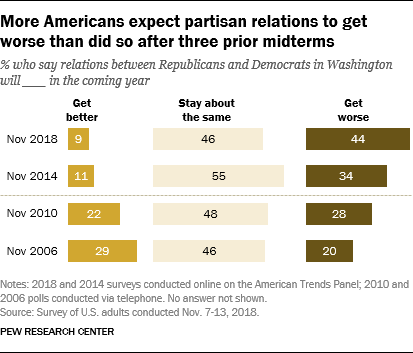 And after years of growing political divisions in Congress and the nation, the public expects little improvement in relations between Republicans and Democrats in Washington in the coming year. Most expect partisan relations will get worse or stay the same. Just 9% expect that partisan relations will improve. The new national survey from Pew Research Center, conducted Nov. 7-13 among 9,451 adults, finds that 61% say Democratic leaders in Congress will be unsuccessful in getting their programs passed into law – but about as many (63%) say Trump will be unsuccessful in getting his programs enacted. While the Democratic Party gained a majority in the House, but not the Senate, in the Nov. 6 elections, Democrats are divided over the party’s legislative prospects: 49% of Democrats and Democratic-leaning independents say Democratic leaders will be successful, while an identical share says they won’t. 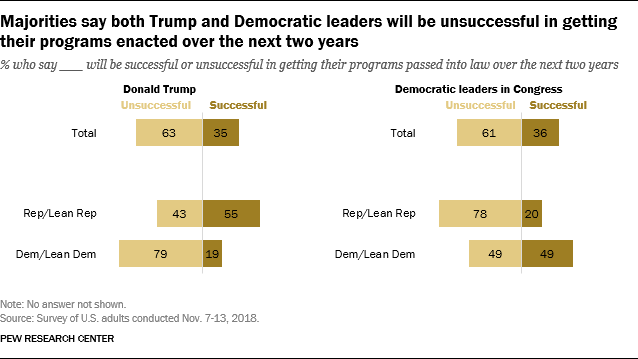 Republicans and Republican leaners are somewhat more positive about Trump’s prospects, with 55% saying he will be successful in getting his programs into law. The public’s pessimism about partisan relations in Washington is now higher than it was after the three prior midterm elections. More than four-in-ten (44%) expect relations between Republicans and Democrats in Washington will get worse in the coming year. In 2014, after the GOP won full control of Congress, 34% said partisan relations would worsen and in 2006, after Democrats won majorities in the House and Senate, just 20% expressed this view. Results for the 2018 post-election report are based on surveys conducted through Pew Research Center’s American Trends Panel – a probability-based, nationally representative panel of U.S. adults administered online. Many of the trends presented in this report, however, draw upon surveys that were conducted by telephone. Results from self-administered (online) and interviewer-administered (telephone) surveys are sometimes different – even when questions are worded the same. This difference is called a mode effect, which is a difference in responses to a survey question attributable to the mode in which the question is administered. Though research suggests that mode effects do not usually result in very large differences in responses, they may account for some of the differences in results. A common mode effect is that online surveys, compared with interviewer-administered surveys, tend to find a lower incidence of item nonresponse (e.g., fewer “don’t know” responses) when an explicit “don’t know” or “no opinion” option is not offered. Most Pew Research Center surveys do not offer explicit “don’t know” or “no opinion” options, and while respondents can volunteer the equivalent of this response, those taking surveys online tend to be less likely to do so (in a self-administered survey, this is equivalent to skipping the question). In addition, interviewer-administered surveys allow the option of substantive volunteered responses (such as “both” or “neither”) for some questions, while self-administered surveys are not able to capture these types of responses. Findings in this report that draw upon trend data from telephone surveys will be clearly labeled in footnotes and the topline. For more information about mode effects, click here. 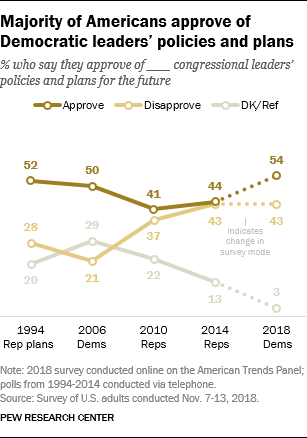 After the Democrats’ victory in the House, the public approves of Democratic leaders’ plans and policies for the future – and prefers the Democrats’ approach to Trump’s on most specific issues, including the environment, health care and immigration. Overall, 54% approve of Democratic congressional leaders’ policies and plans for the future, while 43% disapprove. Opinions about GOP leaders’ policies were more divided after the 2010 election, when Republicans won the House, and after the 2014 midterm, when Republicans won full control of Congress. When asked whether Democratic congressional leaders or Trump “should take the lead in solving the nation’s problems,” more say Democratic leaders should have a lead role. A majority of adults (55%) say Democratic leaders should take the lead in solving the nation’s problems, while 43% say Trump should take the lead. When a separate group of respondents was given the option of whether both Trump and Democrat leaders should take the lead, a 54% majority say they should. Among the remainder, more say Democratic leaders (28%) than Trump (17%) should take the lead in addressing national problems. Congressional Democrats hold especially wide leads over Trump – of at least 20 percentage points – on their approaches to the environment, ethics in government, Medicare, health care and Social Security. The Democrats are preferred by smaller margins on foreign policy, immigration policy and gun policy. Trump has a significant advantage on only one of the 12 issues: 44% say he will have a better approach to jobs and economic growth, while 33% say congressional Democrats will have a better approach; 22% say there will be little difference. These opinions are divided along partisan lines, with Republicans generally preferring Trump’s approach and Democrats favoring congressional Democrats. However, fewer than half of Republicans say Trump has better approaches than congressional Democrats when it comes to the environment (41%) and ethics in government (46%). Among Democrats, majorities say congressional Democrats have the better approach on all 12 issues. A majority of Americans – including majorities in both parties – found something to like about the overall results of the congressional elections. Nearly six-in-ten (57%) say they are happy with the results of recent elections across the U.S.; 41% say they are unhappy. Notably, nearly as many Republicans (55%) as Democrats (60%) say they are happy with the results of the elections. Yet partisans express very different views of results of the elections for the House and Senate. 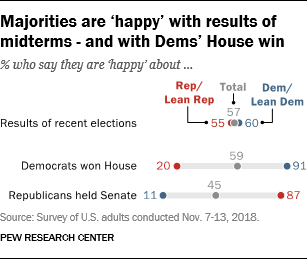 Overall, 59% of Americans are happy the Democrats won the House, while 38% are unhappy. By contrast, somewhat more are unhappy (52%) than happy (45%) that Republicans maintained control of the Senate. An overwhelming share of Democrats (91%) say they are happy the Democrats won control of the House; 77% of Republicans are unhappy with this result. And while 87% of Republicans are happy about the GOP retaining its majority in the Senate, 86% of Democrats are unhappy that Republicans still maintain a Senate majority. A record number of women will serve in the 116th Congress when it convenes early next year, according to the Center for American Women and Politics (CAWP), a unit of the Eagleton Institute of Politics at Rutgers University. A majority of Americans (61%) say this will be a good thing; just 4% say it will be a bad thing, while 35% say it will be neither good nor bad. As previous Pew Research Center surveys have shown, the partisan differences in views of women and leadership are wider than gender differences in these opinions. More than twice as many Democrats (82%) as Republicans (36%) say the record number of women who will serve in the 116th Congress – most of whom are Democrats – is a good thing. The gender gap is much more modest; 65% of women and 55% of men say the highest-ever number of women in Congress is a good thing. Democrats divided on how far to go in investigating Trump administration. With the Democratic Party now in control of House committees, Democrats are divided on whether they are more concerned congressional Democrats will focus too much – or not enough – in investigating the Trump administration. 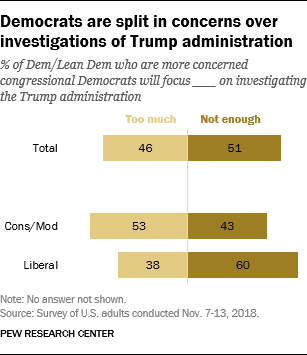 About half of Democrats and Democratic-leaning independents (51%) say their bigger concern is that Democrats in Congress will not focus enough on investigating the administration; nearly as many (46%) say their bigger concern is they will focus too much on investigations. Liberal Democrats (60%) are more likely than conservative and moderate Democrats (43%) to say their greater concern is that congressional Democrats will focus too little on investigations of Trump and his administration. Trump and the midterms. A majority of Republicans (60%) say Trump mostly helped GOP candidates in the House and Senate elections; just 9% say he mostly hurt Republicans candidates, while 30% say he helped about as much as he hurt the party’s candidates. While 69% of conservative Republicans – who make up about two-thirds of all Republicans and GOP leaners – say Trump mostly helped Republican candidates, just 45% of moderate and liberal Republicans say the same. Trump and 2020. Most Republicans and Republican leaners (61%) say they would not like to see other Republican candidates challenge Trump for the party’s presidential nomination in 2020, while 37% say they would like to see a challenge to the president. Democrats expressed similar opinions about a possible Democratic challenge to Barack Obama in 2012, after the Democrats lost their House majority in the 2010 midterm.